Tech.eu has been breaking down the findings of a white paper published by the LIFE project, a European Commission-sponsored project that examined the challenges and failures of European startups. The paper catalogues the obstacles and experiences of entrepreneurs. So far we’ve looked at the supposed skills gap in Europe and the common mistakes made by startups in its very early days, such as finding relevant co-founders and identifying a real problem to solve. In this post, we’re looking at the specific kinds of challenges that startups meet at the four different phases of their journey – Discovery, Validation, Efficiency, and Growth. 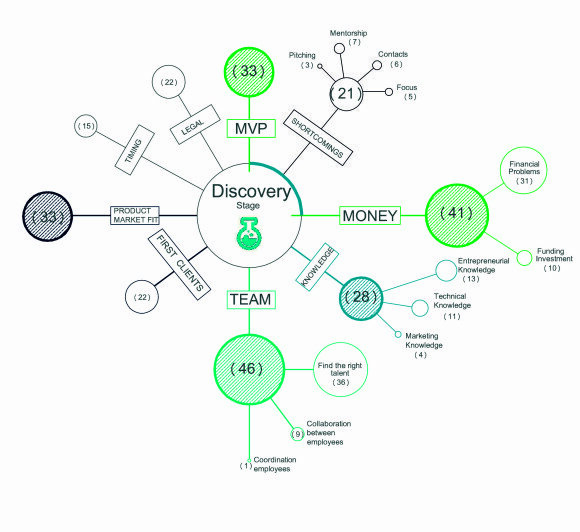 The first phase, ‘Discovery’, is where most startups encounter problems (above), perhaps unsurprisingly. Of the startups surveyed, 74% had experienced problems in this phase, mostly in the areas of Team, Money, and Minimal Viable Product (MVP). Other problems included market fit, legal matters, and gaining first clients. From this data, the LIFE project concluded that – regardless of whether it’s an experienced or first-time entrepreneur – most founders experience problems in this phase. This led to the creation of the graph below, which drills down further into the data to better represent the kind of problems faced at the ‘Discovery’ stage. 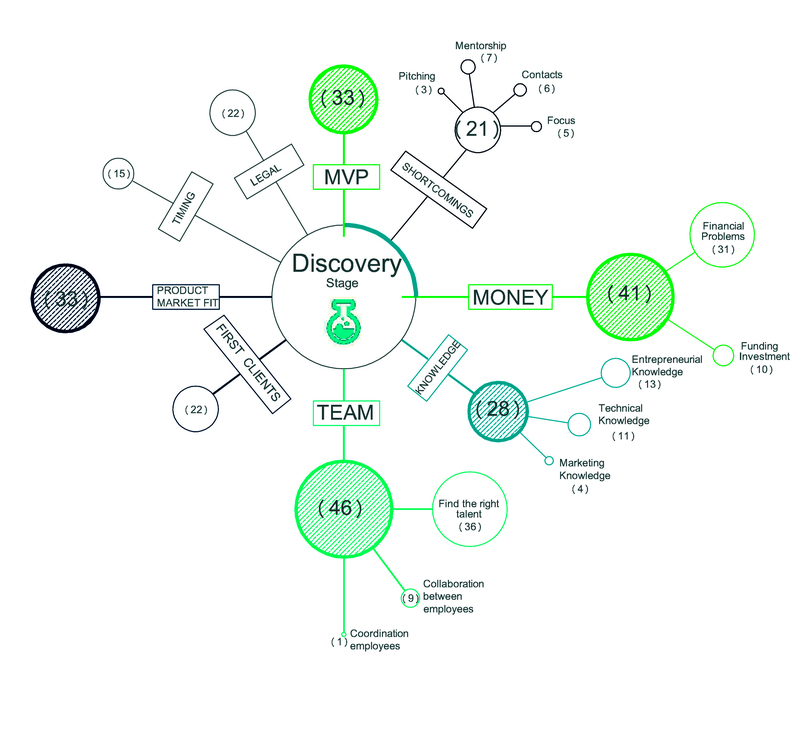 For example, this graph breaks down the 43 problems cited in Team to show that the majority (36) of these matters related to finding talent but collaboration and coordination of employees was a problem too. Similarly, we see a breakdown of data on money problems that shows at ‘Discovery’, these kind of problems pertain more to financial management rather than seeking investment. 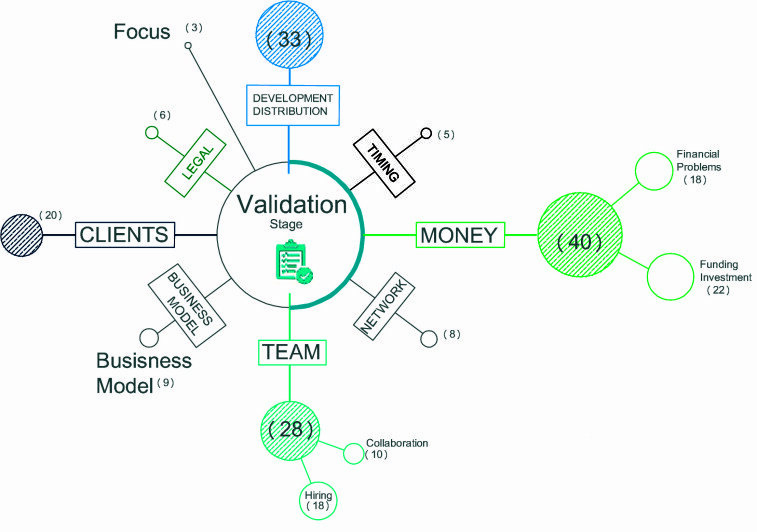 In the ‘Validation’ phase, even more startups recorded problems – 90%. Money, Development and distribution of the product and Team were by far the three biggest obstacles. According to the survey, Validation is where most startups quit or decide to pivot. This is reflected in the high number of startups that said they faced issues. The graph above once again breaks down the answers to illustrate the exact kinds of problems startups faced at ‘Validation’. Unlike the previous phase, the split between Money problems is little more even as the pressure to find investment begins. Of the 40 problems cited here, 18 were financial and 22 were investment-related. 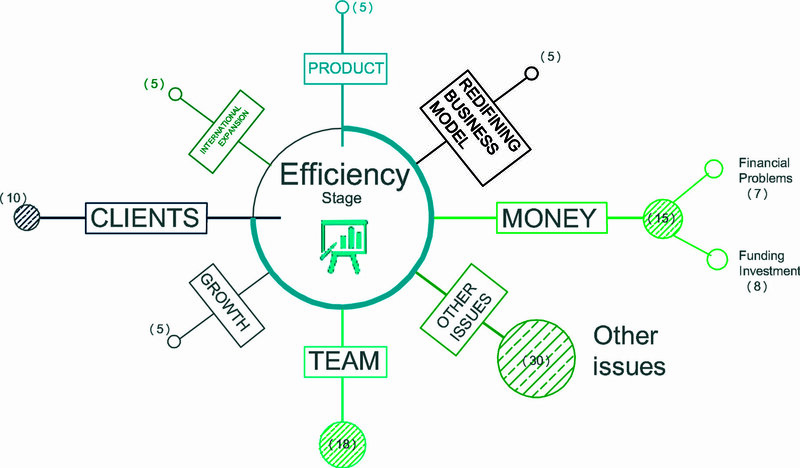 It became very clear at the ‘Efficiency’ stage that the vast majority of startups experienced problems at all stages. The graph below shows another high figure, this time 80%, of startups who says they experienced during this phase. However, the matter gets a little vague at this stage. To wit, 30 complaints were filed under “Other Issues” while Team and Money comes in second and third. The previous phases had clear explanations of the problems – recruitment, costs, investment – but here that’s not the case. Below we see another breakdown of the rest of the results. The ‘Growth’ phase is where many startups hit a level of maturity where money isn’t quite the issue. More often than not, startups have achieved some level of funding by this phase. The problems that emerge here relate to expansion and scaling. Developing a sound strategy for growth and internationalisation proved to a big obstacle. This is illustrated in the graph below. Breaking down the problems in the expansion category, the LIFE project found that most of the problems related to time and resources. Experience, strategy, focus, goals, and contacts accounted for the rest. In conclusion, LIFE found that Money and Team issues are the most recurring challenges for startups, but it’s interesting to note that the priorities change with each phase.